Hi guys, we are back with another feature interview with our ex DCTian. 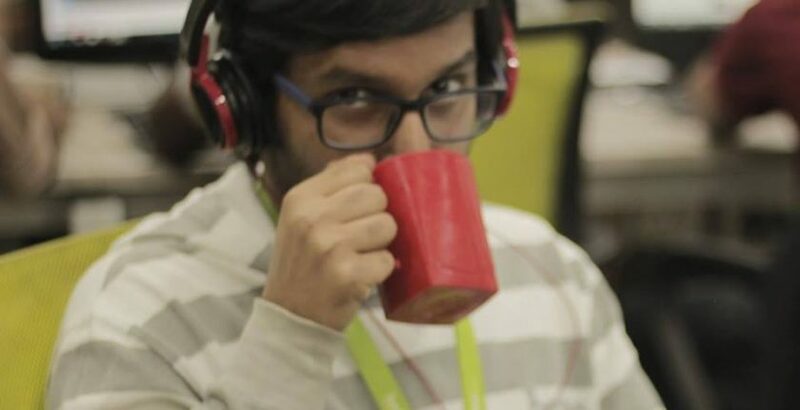 Mahesh was one of those freshly graduating students with an intention to prove that programming was indeed his cup of tea when he came to us. He enrolled with us to study Ruby on Rails as he wanted to make a huge sprint in the rat race. But we saw something far more interesting in him- his hunger to soak in as much knowledge as he can. Hence we designate him as “The Knowledge Expender”. Today, we see this Rails Rockstar faring extremely well in his field. Let us hear more from him. I remember the first time I met Aniruddha in DCT.I was in the 7th semester of my engineering degree (Computer Science). I was so clueless and worried about my career at that point in time. My college did not have good placements and I knew the world outside was very competitive. I was aware that I was still a novice programmer. But I always had this zeal to learn something new and exciting. I realized that to make my job prospects stronger I needed to have something extra in my resume, something that would be valuable, and was yet, relevant to the current job market. Through a known acquaintance I was introduced to Aniruddha and I went to him for guidance. He proposed a very convincing argument about Ruby and its incredible benefits. I felt reassured about the reach and progress involved, and enrolled myself in DCT. After that, there was no looking back. Aniruddha has been my most trusted mentor, and has undoubtedly helped me reach heights I could never achieve by myself. What was your experience at DCT Academy like? My time at DCT was probably more knowledgeable than my entire engineering course. Having said that, I sincerely believe I grasped most programming concepts while learning from Aniruddha . He turned out to be inherently a brilliant orator and made the subject sound seemingly simple. He attempts to give his best in every class, and he makes earnest efforts to mould his students into real pros. He has this unique, unrestrained patience to answer every query from a student, and make sure that they do understand the topics. More importantly, he trains everyone to be industry-ready, adopting and propelling the best industry practices. He has been an unfailingly constant source of guidance and support, for me and many others. How has DCT Academy helped in your professional pursuit as a software techie? The biggest fear that I constantly faced was that I may somehow never get a job and stay unemployed. No sooner did I complete my graduation; I was placed in a very good company and I realize how much training with Aniruddha has helped me see my true potential as I now implement and build software. Now I get emails flooded with offers to join various companies with really good pay. What more can I expect? Do you plan to take up more classes in the future? What are you keen on learning next? Is there a piece of advice that you might like to give current and future students of DCT Academy? I think it is very important to determine your own path. For that, you need to have both long-term and short-term goals. Stress upon your short-term goals, but never forget your long-term goals. Try to network as much as you can. You never know who or what may help you grow professionally. By networking you not only get great opportunities but also get to learn from better and more proficient people. But the most important focus should be on learning. One must never stop learning for nothing what you learn will go to waste. Would you recommend others to take up this course at DCT Academy? I would surely recommend anybody to approach him and seek his training without any further doubt. A person with zero programming knowledge can become an expert if he/she is trained by Aniruddha. I believe this is collective acknowledgement from many of us who studied under him. Aniruddha probably does not realize that he is transforming many lives like mine. So if you want your lives to be transformed too and see yourselves on the pinnacle of your career, do join DCT and learn from him.